In cold split injection, the liquid plug is introduced into a cold vaporizing chamber. This prevents syringe discrimination, and the sample volume can be more reproducibly introduced than in classical hot split injection. After the syringe is withdrawn, the inlet is heated and the sample will go to the column, the split flow is open all the time during the injection and the sample transfer. The sample is not vaporized instantaneously; evaporation of solvent and solutes occurs in the order of their boiling points. Therefore, sample components reach the column sequentially and the amount of sample at the head of the column directly after injection is smaller than the amount found with flash vaporization inlets. 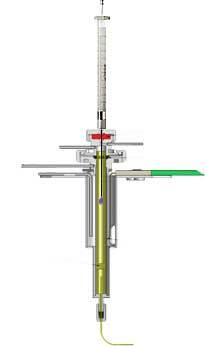 This permits the injection of larger sample volumes before loss in column efficiency is experienced. It also provides more accurate and reproducible sample splitting since there is minimum pressure and flow perturbation within the inlet during sample transfer. Cold PTV splitless injection has the advantage of lower sample discrimination and decomposition compared to hot splitless injections. In cold splitless injection, the split vent is closed during injection of the sample. The inlet is then heated and the sample is transferred to the column, which is maintained at a low temperature to re-condense the solvent for solvent focusing. After a preselected time (30 to 180 s), the split line is opened to vent residual vapours from the liner as is done with hot splitless inlets. Because of the cold sample introduction the vapour cloud can be controlled and no explosion of the solvent will take place, as a result a flashback is minimised. Both techniques can be done easily with the OPTIC-4 inlet.